As my colleague Skerdian covered in the morning forex brief, the greenback has resumed its year-long pattern of weakness. While it is too early to tell if we will see a rate hike out of the U.S. Federal Reserve in December, the dollar is beginning to fade against several of the majors. The last three sessions have shown a considerable bounce in the EUR/USD. This is a positive development for traders as it brings a few key resistance levels into play. Using multiple time frame analysis is a great way to examine a product from several perspectives. 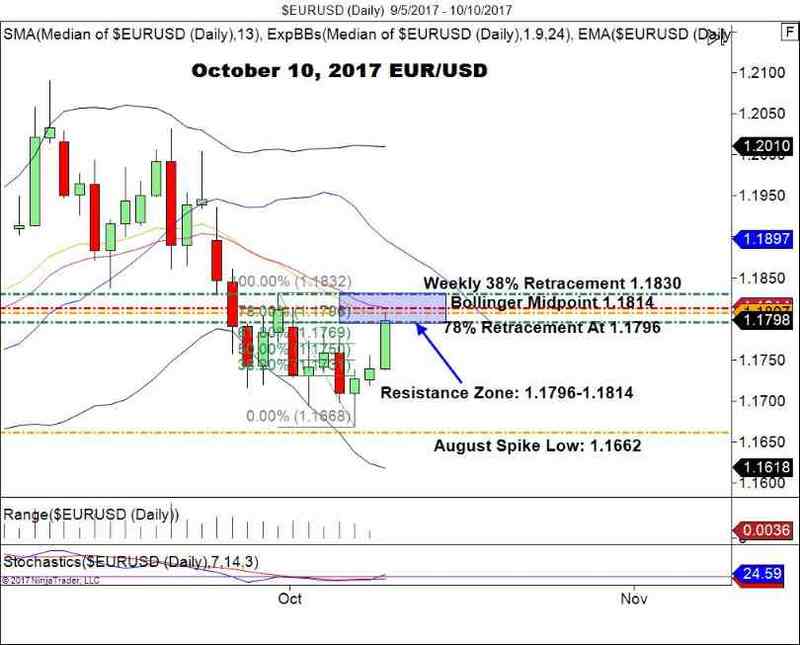 For the current session, the daily chart for the EUR/USD gives us a defined resistance area. Last week’s high of 1.1814 will bolster participation. The 78% retracement from the high on Sept. 29 to the low on October 6 is 1.1796. The 20 Day EMA is 1.1807. The Bollinger Midpoint is 1.1814. There is a formidable resistance zone set up for the rest of the U.S. session from 1.1796 to 1.1814. With no market-moving news items due out, this area is likely to form an intraday top. Bottom Line: The August spike low of 1.1662 has proved valid, acting as robust support. Depending on Friday’s CPI release, we may see rotation back towards this level. For the remainder of the U.S. session, an intraday short from either the 20 EMA or Bollinger Midpoint from 1.1807-1.1814 is a good location for a sell. A stop above the spike at 1.1832 provides an opportune 1:1 R/R intraday position scenario.